This is a complete set of the 45 official U.S. President portrait photo prints. 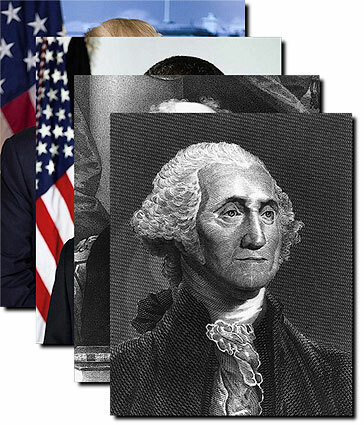 Scroll down to see all 45 presidential portraits that are included in this set. Earlier era presidents didn't necessarily have "official" portraits, and many later presidents have more than one "official" portrait. The black & white set was curated and restored by us for display at the 2008 Democratic National Convention (President Obama was added later). For those who prefer the presidents of the color film era to be in color, we offer this set. For B&W purists, here is the Full B&W Official Presidential Set. - Order by 8am EST Mon. - Fri., select 1, 2 or 3 Day Shipping in Checkout, and we will rush process and ship this print the same day. - Order by 8am EST Mon. - Fri., select Standard or Economy Shipping in Checkout, and we will ship in 1-2 business days. - Need it by Christmas, Dec. 24? Order by Wednesday Dec. 18 at 8am EST and choose "4-7 Day Standard USA" shipping. We will be rush processing all "4-7 Day Standard USA" shipping orders going to the lower 48 states on Tue. Dec. 17 and Wed. Dec. 18 to schedule them to arrive by Dec. 24 or earlier. If you need your delivery sooner, we suggest using an appropriate 1, 2, or 3 day shipping mode, or consulting our FedEx Ground Delivery Map to see how many days it will take for your "4-7 Day Standard USA" delivery to arrive to your part of the country.